Nowhere else in the history of armed conflict was there ever a situation in which a combatant side looked after its mortal enemy’s welfare, fed it, supplied it with essentials and powered it with electricity. Invariably, the reverse is true. Combatants besiege enemies, seek to starve them into submission and to disable their ability to fight. That is the norm of warfare – most especially vis-à-vis aggressive antagonists who persistently stoke the furnaces of hostility and relentlessly make civilians their primary targets. But despite a dozen years of assorted barrages from Gaza – punctuated by particularly severe episodes, as we witnessed only days ago – Israel makes sure that Gazans are well fed and lack nothing vital. The bizarre outcome is that we sustain and reinforce, at the expense of Israeli taxpayers, the very terrorists who aim to wipe out these Israeli taxpayers. This is counter-intuitive in the extreme. Moreover, the world does not acknowledge our peculiar largesse, one that forcefully grates against our fundamental interests. Despite shipments of basic commodities to Gaza, we are pilloried as imposers of blockades and creators of humanitarian crises –nonexistent though they are – in the Strip. 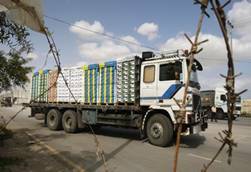 As trucks laden with goods crossed from Israel into Gaza, the Hamas narrative was only underscored. Although our power plant in Ashkelon facilitates the continued manufacture, import, upkeep and deployment of more missiles, Gazans fired at that very power plant. Something is wrong with this picture. It has been an acute anomaly for years, but it became all the more insufferable as the entire country from Tel Aviv southward was viciously bombarded, with the undisguised aim being the premeditated mass murder of Israeli noncombatants. Why should these attacked Israelis continue to aid and abet their implacable enemies? Our supplies to Gaza help wage war against us. Why should Israelis be expected and required to look after their enemies? Would any such demand be put to any other nation under concerted lethal fire? All this is exacerbated by the Palestinians’ consistent underlying ideology that perceives attacks on Israeli civilians as a God-given right but which denounces Israeli self-defense – no matter how sterile and pinpointed its intention – as illegitimate and a war crime. That is the belief of Gaza’s masses, and that elementary justification of terrorism cannot be rooted out via surgical air strikes. The population in Gaza needs to understand that there is a price for its complicity in the attacks on its Israeli counterpart. At the very least this ought to mean – even after the cease-fire – that we cannot continue to take care of our enemies’ daily needs. On the one hand, our air strikes were geared to take out terrorist infrastructure, yet our other hand buttressed that very infrastructure. Official Israel clearly dreaded the backlash of world opinion. This fear undermines our ability to defeat or even to significantly dent Gaza’s terrorist infrastructure for the long haul. Without a thorough revamp of mind-sets here, operation Pillar of Defense may well yield tactical short-term benefits, but it will not make a strategic difference further down the line. A multiplicity of cogent rationalizations existed against a ground invasion of Gaza, but there is nothing nearly as compelling against beginning a true and final disengagement from Gaza. Instead of strengthening those who do their utmost to destroy us, it is high time we quit being suckers. It is also time to disconnect Gazans from our power grid, telephone and communication services (for which, inter alia, they never pay). Maintaining the absurd status quo heaps folly upon folly. Did this also not happen when we had the whole Egyptian army surrounded, way back during one our previous wars? A suggestion: Why do we not take from money that we collect for the Palestinians, all the costs in respect of expeses that we are mulct into by their bad behaviour? I feel though that there would not be enough to cover costs, but it would be a good lesson to stop their negative actions. It is common knowledge that you cannot stop Water, for health reasons, but you can stop Electricity. The Egyptians stopped supply of gas to us & the Jordanians. What is wrong with us. It seems to be the opinion in Israel that the world will like you better if you are humane, rather than treat Islamist as they treat you. I have not seen that work. In fact the opposite seems to be true. Consequently, your way is clear. One does not have to stoop to the barbarism of the Muslims, yet many things can be stopped as suggested by Ms. Honig. It makes no sense to me to aid in Hamas’s destruction of Jewish citizens. Cut off electricity with the first missile or rocket. Make them pay for terror. The supplying of Gaza reveals how Israel has been so well trained by the International community to perform a show of national suicide,restraint,retreat and resupply, before a world audience, not to show how nice and kind Jews are but how easily they are herded onto the cattle cars with the least amount of resistance. Israel’s servile leaders perform strange acts of insanity and national suicide to prove how merciful they are to the cruel. This is not noble behavior but perverse and evil. ‘But Saul and the people spared Agag and the best of the sheep, the oxen, the fatlings, the lambs, and all that was good, and were unwilling to utterly destroy them. ….Now the Lord sent you on a mission, and said, ‘Go, and utterly destroy the sinners, the Amalekites, and fight against them until they are consumed.’ 19 Why then did you not obey the voice of the Lord?… But Samuel said to Saul, “I will not return with you, for you have rejected the word of the Lord, and the Lord has rejected you from being king over Israel.”…. Then Samuel said, “Bring Agag king of the Amalekites here to me.” So Agag came to him cautiously. Gaza can be the key for the future…and that would be the real payback ! With all the ‘mental misfit leadership’ that Isreal has experienced with Netanyahu, Barak, Ohmert etc. vis a vis it’s sworn enemies to delegitimize and destroy Israel, where, on the ‘horizon’, is there a potential ‘new leader’ who can take control of a ‘quickly deteriorating’ Israeli situation? Being a WW2 veteran who has witnessed the ‘way to win a war’, it becomes more obvious ‘daily’ that ‘ a prerequiste of becoming an Israeli PM candidate for office is to ‘take a mental and knowledgable test of “How American and its Allies won WW2! ….Bless you Sarah for all the brilliant articles you have given your readers. High treason is in fashion in Israel. The perpetrators were Beilin, Peres, Rabin, Sharon…All of them have a part in this theather of absurd. Why is this article necessary? Perhaps when Israel stops feeding their enemies, and ejects hostile news reporters; the world might tone down their condemnation. Just a thought.